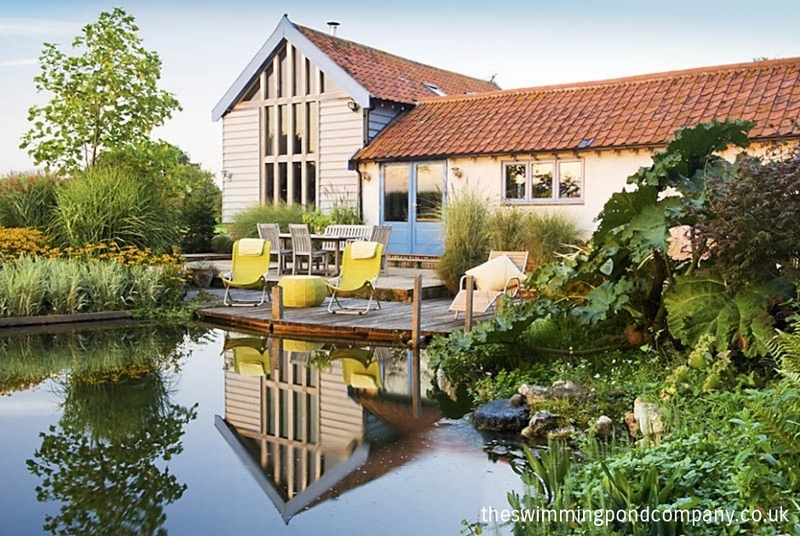 Country House Magazine - The Swimming Pond Company Ltd.
A chlorine-ridden, turquoise swimming pool is neither eco-friendly nor will it necessarily add value to your property. Catharine Howard suggests some natural alternatives. Swimming pools are so last century. Fly into Heathrow in daylight and as the suburbs come into focus, little turquoise rectangles in serried rows wink at you – it’s enough to call for the return of the window tax. They are unsightly and give anyone dipping in a good dose of chlorine, which as we know was used as poison gas in the First World War. If that doesn’t put you off, a trawl through estate agency chatter on the web will confirm what we all suspected: a swimming pool will not increase the value of your property and may make it more difficult to sell. It’s up there with stone cladding as a definite worse-value ‘improvement’. One reason for this is the maintenance involved – all too regular visits from a contractor who comes along with giant dentist equipment to brush and flush out your pool. With the energy used for heating, running costs will equal the bills for a three-bedroom house. Are you convinced? Well, the planners are, and in some parts of Britain are putting up resistance to their installation. An infinity pool on a rocky hillside in Crete is one thing, but excavated out of a valley in an Area of Outstanding Natural Beauty and framed by metres of quarried stone from India, quite another. Where is the reference to the surrounding landscape? A sense of place – what Capability Brown talked of as consulting the genius loci – has been overthrown. But before you give up on the idea of swimming in your own garden and reach for the Barbados holiday brochure, do some research on a holistic, environmentally friendly and beautiful alternative: the natural swimming pond. One of the saddest depredations in the country is the disappearance of the pond. Every farm had at least one for watering the horses and other beasts and washing the cart. They were also a magnet for birds, from kingfishers to thrushes, and attracted dragonflies, damsel flies and newts. Once filled in and built over, valuable habitats for wildlife are irrevocably lost. A good way to learn more is to read Natural Swimming Pools: Inspiration for Harmony with Nature by Michael Littlewood (Schiffer Publishing, £39.95). He is the grand man of this technology and explains how plants are the living filters ’effectively acting as a giant kidney for the whole pond’. A natural swimming pond will give you an amazing asset to draw you out into the garden all year round. What you get is a swimming area and a natural functioning wetland. To get a picture, let’s take the figure of a pond of say 100m². About 50m² will be given over to swimming in and then the rest of the pond, which is quite shallow, will have the job of cleaning and regenerating the water – there are no chemicals involved at all. The water is purified by the plants – flag irises and so on – living in a substrate of gravel. They take up nutrients through their roots that have been derived from bacteria breaking down organic waste thus keeping the water clean. The water is warmed in the shallows and then pumped back to the swimming area, taking the cold edge off the water temperature. On the mechanical side there is a pump and hidden pipes to circulate the water. It looks entirely natural – and it is. I visited Paul Mercer from The Swimming Pond Company in Norfolk, who has a sunken water tank that collects all the rainwater from the roof of his house. He waxed lyrical about the sensation of swimming in soft rainwater. The luscious planting around his pond is kept at bay by an internal wall but once in the water, you have the sensation of bathing against a backdrop of watercress and peppermint, with dragonflies hovering above. If you have a conventional swimming pool, don’t despair: it can be converted by an expert. Clear Water Revival (clear-water-revival.com) has made a speciality out of restoring such pools – take a look at their site to see the before and after pics. Yes, there is a bit of maintenance – cutting back the pond-side plants in winter and clearing out leaves and checking that pumps are doing their stuff. As to cost, Paul Mercer reckons you should budget on £300-£450/m²: it’s not cheap, but remember you are giving yourself much more than just a swimming area: it is something beautiful to look at all year round and is perfectly in tune with the zeitgeist.